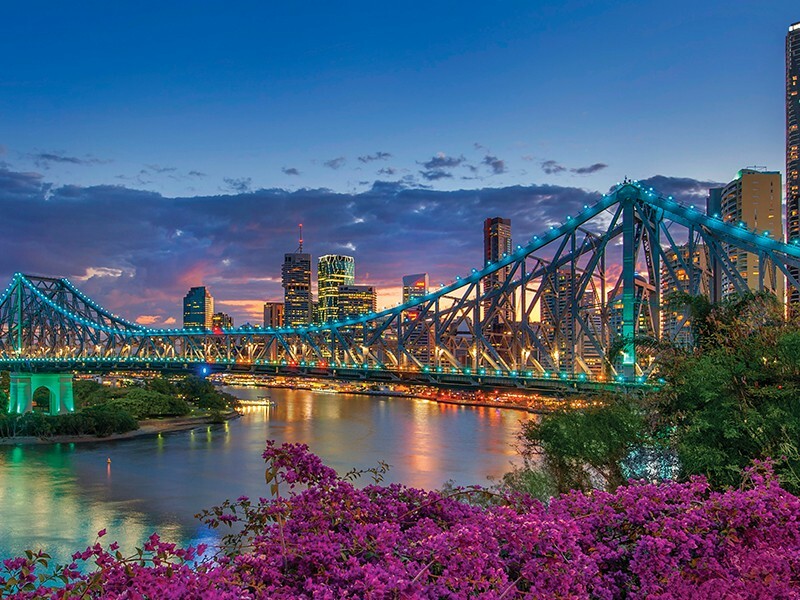 Imagine for a moment, being whisked away on an indulgent city escape to the heart of Brisbane for a weekend of fine dining, retail therapy, rich cultural experiences, cocktails by the heated pool, and utter relaxation with your loved one. Welcome to the Brisbane Marriott Hotel. You will either arrive in the main Queen Street entrance or via the valet service on Howard Street, both deliver an impressive first impression with ornate marble framing paired with designer furnishings that set the Marriott miles apart from any other Brisbane city escape. The lovely and proficient staff are welcoming from the moment you enter, making you feel relaxed and ready to enjoy your holiday in true Marriott style. 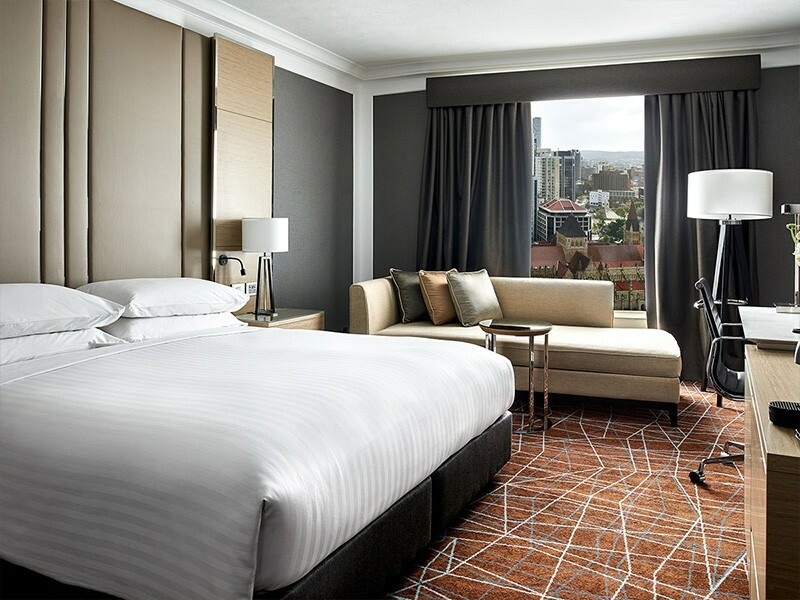 The Brisbane Marriott Hotel boasts 267 air-conditioned rooms that either boast city scape or Brisbane River panoramas that are sure to impress. Marvel at the Storybridge lit up like a rainbow, down to sheer cliff face of Kangaroo Point Cliffs floodlit for the rock climbers, or across Brisbane city sprawled out as far as the eye can see. After you’ve had your fill of the Brisbane vistas you will begin to notice the other elements that make the Brisbane Marriott special. Pack your suitcase out of the way in the special storage that includes draws is a convenience that is not standard among hotels, but is certainly welcome! 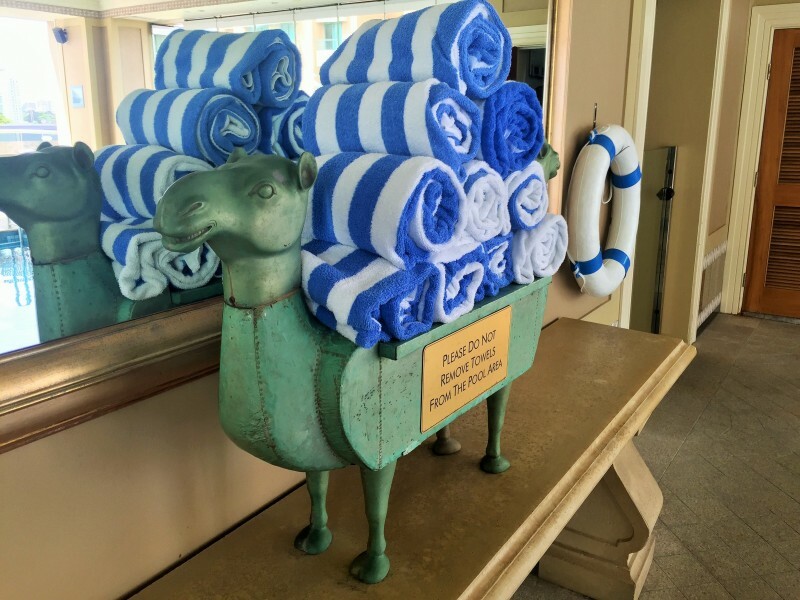 The bathrooms are spacious, have separate shower and bath facilities, and in true Marriott style incorporate anti-fog mirrors meaning you can step out of a hot steaming shower and immediately apply your make up or brush your hair. Like magic. Lining the vanity, you will find luxurious, complementary toiletries as well as a hair dryer for your convenience. Exit the bathroom and the enormous, king beds seem as if they are singing their siren song enticing you to slip between the sheets just to test their comfort! They do not disappoint. If you can manage to stay conscious while in the miracle beds, the giant TV’s are mounted for optimum in-bed, in-room entertainment. 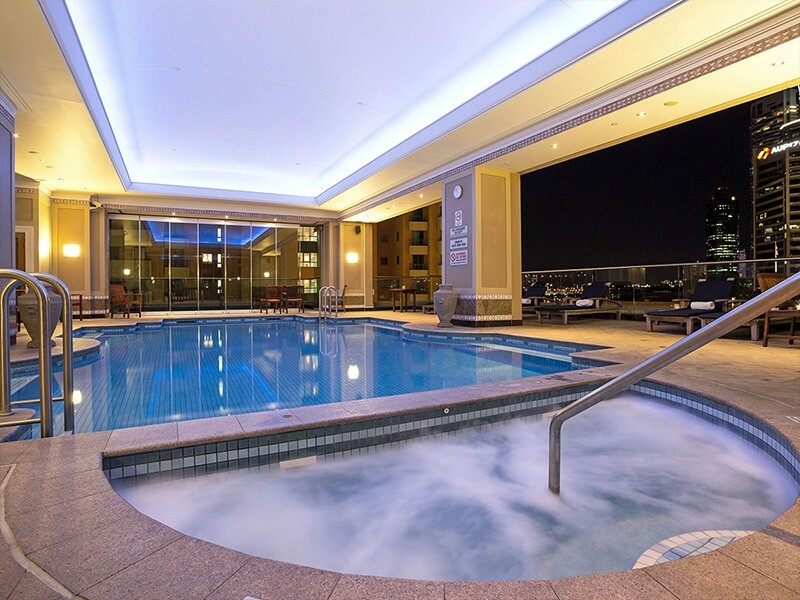 The Brisbane Marriott Hotel distinguishes itself from other city hotels with a fantastic heated pool area that comes complete with spa, sauna, sun lounges, and deck to relax atop. The pool is undercover and heated to a perfect 26 degrees meaning you can enjoy the facilities at any time, while the sun beds still enjoy plenty of sunshine for guests to soak up for the perfect sun-kissed glow. While guests are soaking up sunshine, splashing around in the pool, heating things up in the sauna or spa they can also order light meals and drinks all from the convenience of the pool-side phone. There is a menu to order from, so all you need to think about is your selection and within a few minutes it will appear by your side! For the health conscious there is a fully equipped gym that is serious about providing you with the best equipment for your holiday calorie burning. The large room is lined with treadmills, cross trainers, and bikes as well as light dumbbells, heavy weights up to 22kgs, and a cable machine. The two wall-mounted flat screen TV’s are sure to keep you entertained while you sweat it out. Post-work out you can enjoy the views from the river terrace located just outside the gym. Of course, holiday exercising sounds absurd to some! Fear not, the Dome Spa Retreat is for you. Men’s services, massage, foot baths, facials, manicures and pedicures, eye treatments, body wraps and scrubs, as well as couples treatments await you. Our Hightide Hot Tip is to partake in the couple’s treatment, as the experience is done together with expert masseurs using beautifully scented oils finished with chocolates and champagne by the pool. For couples with little munchkins alongside there are child care services at the ready to allow you time to pamper yourself, indulge in some retail therapy, or simply enjoy some adult time. 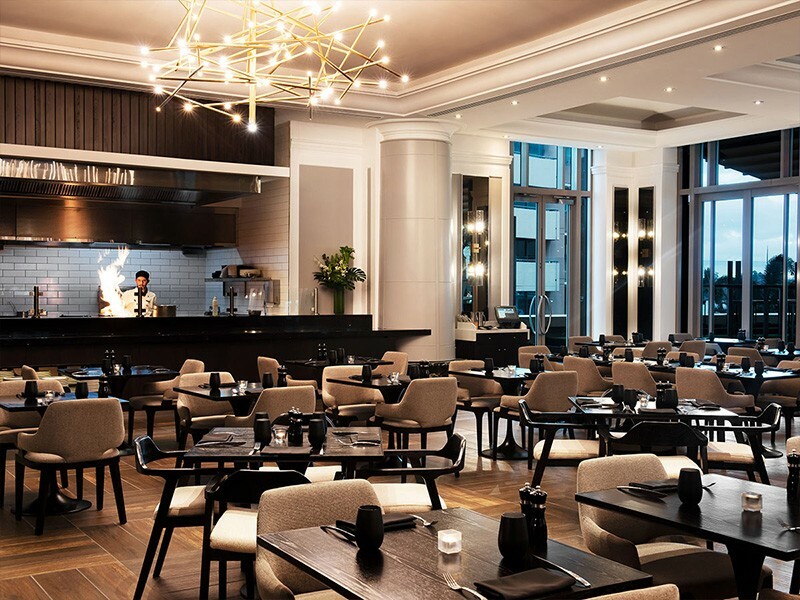 The Motion Bar & Grill is the Brisbane Marriott Hotel’s famed restaurant that serves delectable Australian cuisine with an Asian twist paired with an extensive selection of both local and international wines. The morning buffet transforms the Motion Bar & Grill into a breakfast wonderland – enormous glass fridges line the wall filled to the brim with chocolate and strawberry milks, Greek yoghurt, fresh juices, cold cut meats and more. The hot section is filled with your favourites including both pancakes and omelettes made to order! 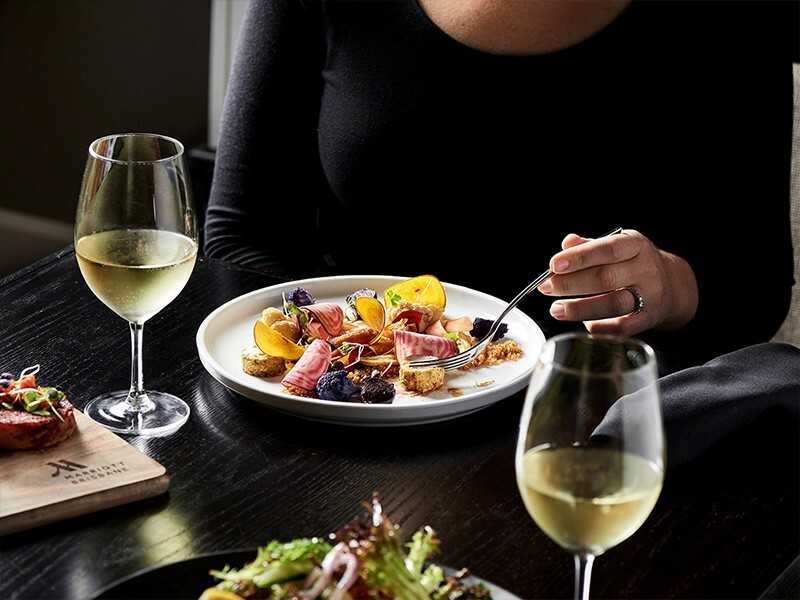 Lunch and dinner boast menu’s full of Queensland prime steaks, freshly caught seafood, delicious locally sourced vegetables and much more. Choose between standard seating or comfortable booths for larger groups or families. When you’re on the go or feeling like a casual bite to eat, drop by M Bar. They cater to your coffee, tea, and chai requirements as well as offering pastries, wraps, and sandwiches. There is also the executive lounge for those staying in executive rooms that boasts a delightful mini buffet breakfast, evening canapes and drinks, and a dessert bar. These meals, snacks, and drinks are all paired with stunning views of the Brisbane River gifted by the executive lounges location on one of the highest levels. There is seating for groups of all sizes from single seating to couples to larger groups. If you happen to venture out of the Brisbane Marriott for a bite to eat you will be met with a myriad of restaurants to choose between some of which include the unbelievably fresh seafood at Jellyfish Restaurant situated on the boardwalk, Matt Moran’s famed and accredited Aria restaurant, Jade Buddha for Asian cuisine or simply lovely cocktails and a great atmosphere, Mecca Bah who specialise in Middle Eastern and Moroccan delights, Cha Cha Char Wine Bar & Grill boast fantastic steaks and an extensive wine list as well as many others. For a more casual approach to dining head slightly out of the city to Northshore Hamilton where a whole new world of cuisine appears before you at Eat Street Markets. 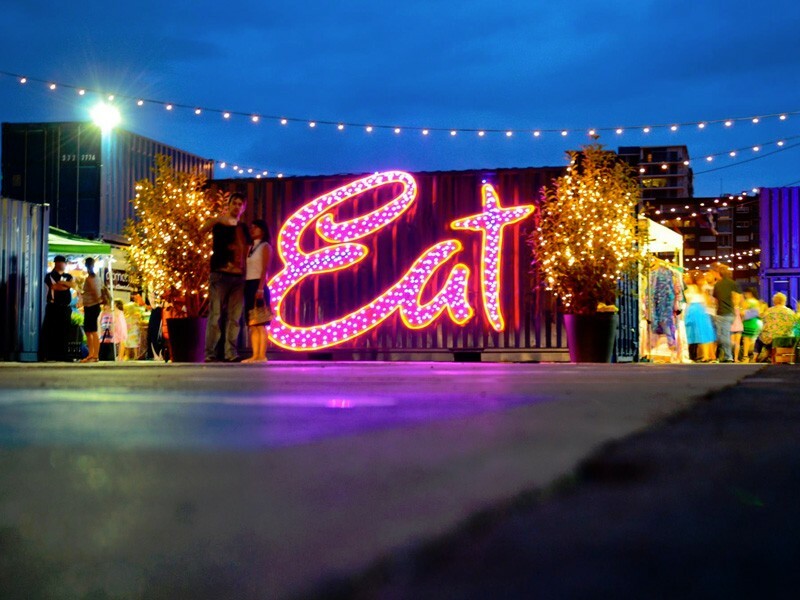 This eclectic market place boasts a lively atmosphere, shipping containers full of food from every culture, arts, crafts, boutique beers, local and international wines, fashion, art and much more. Situated perfectly in the heart of Brisbane CBD, staying at the Brisbane Marriott Hotel means you are just a 5 minute walk from Queen Street Mall and right on top of Eagle Street Pier, but still away from the noise and hustle and bustle of the main strip. 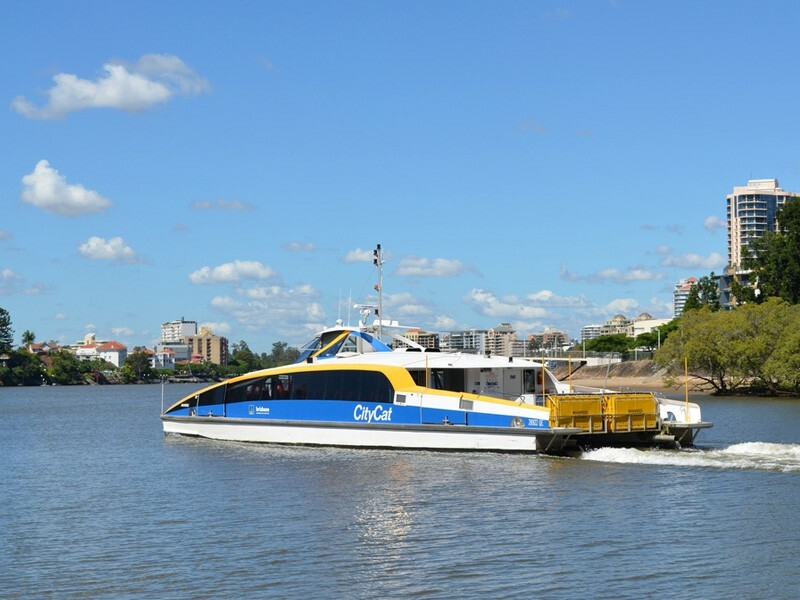 To explore the city further, our Hightide Hot Tip is to jump on a Brisbane City Cat and travel down the river in style. One of the most popular places to stop is the man made beaches of South Bank – spend your day lazing by the water and swimming before heading out for ice cream or a bite to eat. Little Stanley Street is a favourite for gorgeous restaurants and caters to Japanese, Turkish, Chinese, Vietnamese, Italian as well as many more cravings. You’ll even find the South Bank iMax theatre on your travels just one street back again offering the latest in cinematic treasures. To scratch your cultural itch venture towards GoMA the Queensland Gallery of Modern Art where you will find a beautiful array of permanent displays including Australian Art Collection, International and Asian Collection as well as temporary displays such as ‘Lure of the Sun’ collection by Charles Blackman that is live until January 31st 2016. Nestled next door to GoMA is the Queensland Museum home to Brisbane’s famed dinosaur attractions – with one ready to greet you at every entrance! There are also fantastic interactive displays throughout the museum that get the kids (and even adults) involved. 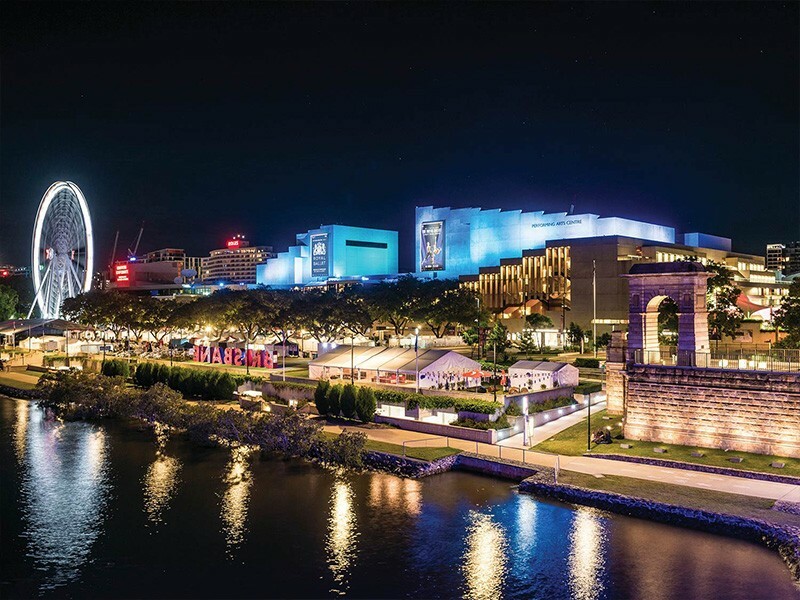 For a touch of drama, QPAC, the Queensland Performing Arts Centre is also situated in South Bank and has some excellent performances scheduled in late 2015 and early 2016 including Les Miserables, We Will Rock You, Ladies in Black, The Gallipoli Symphony and much more. 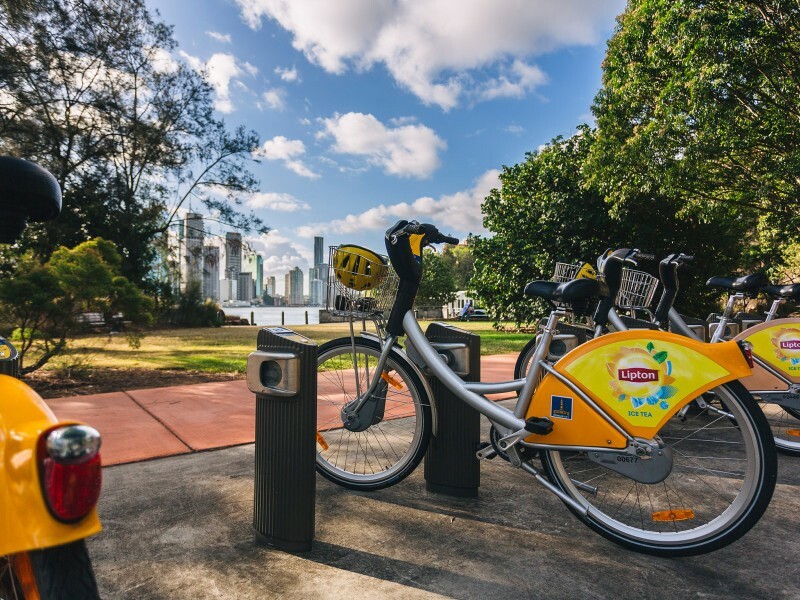 To see Brisbane form a unique point of view, jump on one of Brisbane’s bikes for hire located around the city and cycle down one of the many bike paths that roam from the heart of Brisbane out to South bank, West End, Bulimba or further – it’s a great way to get your heart rate up and see what Brisbane has to offer! Retail therapy is offered by several professionals in Brisbane, although the most sought after must be Queen Street Mall – this haven for shoppers offers an unparalleled variety of local, national, and international flag ship stores that add up to over 700 stores. Discover why Brisbane is a shopping heaven by exploring the Wintergarden, Queens Plaza, Brisbane and Tattersall Arcades, Broadway on the Mall, MacArthur Central, the Queen Adelaide Building, and of course the Myer Centre. Each of these centres and stores are spread across mall frontages, heritage listed buildings, and brand new centres making exploring them an exciting way to take in Brisbane’s heritage and culture. Brisbane City car parking can be pricy and somewhat hard to find, so we've done some research and found the perfect offsite car park for the Brisbane Marriott Hotel for you! The Emirates House located on 145 - 175 Eagle Street, Brisbane, is the closest secure car park that offers discounted parking from as little as $10 per day over the weekends when you prebook via the website. 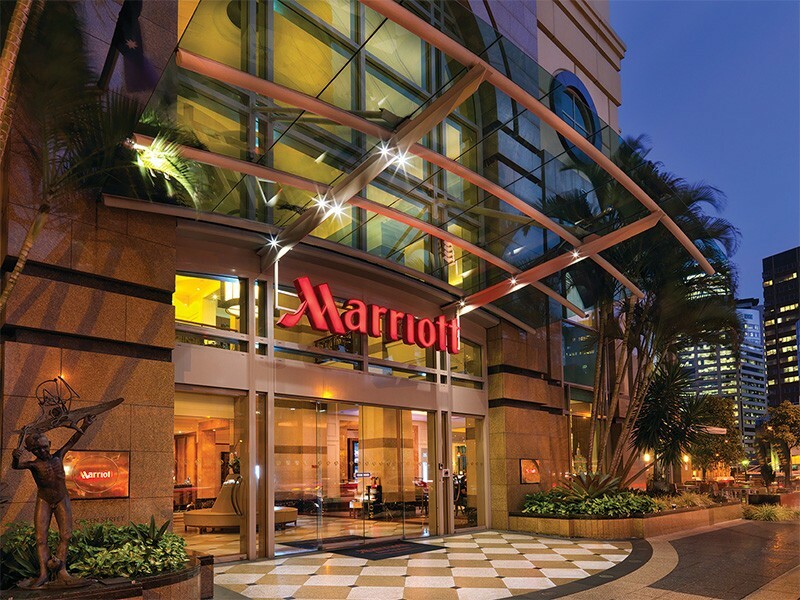 A true 5 star experience, the Brisbane Marriott Hotel is sure to impress, entertain, and enthral – it is the perfect place to enjoy Brisbane’s dining, culture, shopping, and attractions all while enjoying the first class luxuries of a true Marriott experience. Speak to the team at Hightide Holidays to escape to the city for a holiday filled with unforgettable cuisine, rich culture, and utter relaxation.